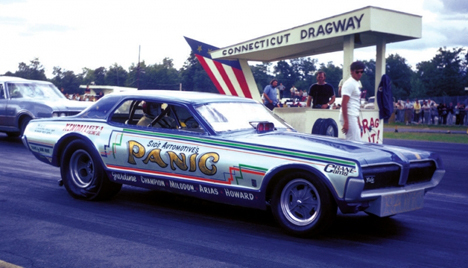 The Panic Cougar was one of a couple of funny cars out of Brooklyn, New York. The Cougar ran out of the Sid's Automotive Shop and driven by Joel Kimmerman (better known as Joel Kim). The funny car was purchased from Ed Schartman and totally rebuilt. The team narrowed the chassis and installed a Ramchargers Chrysler Hemi for power. The Panic Cougar ran a best of 7.89, 189 in 1971 before Kim retired to get married. A search for a new driver was launched, but never came to fruition. The Sid's Automotive Panic team disbanded and retired from funny car racing. (Photo courtesy of Big Bob Snyder; information from Dennis Doubleday and Draglist files). The Green Hornet team was a partnership of two funny car teams that combined their forces to run this green Mustang. 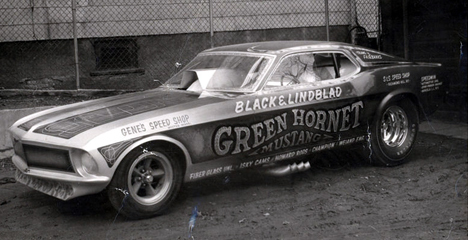 Brooklyn, New York racer Joe Black had raced the Green Hornet as a Camaro and a Firebird, first as an unblown funny car and later with a blown setup. Rollie Lindblad was a well-known chassis builder from the state of Maine who raced the Crazy Horse Mustang in 1969. The pair chose the Mustang to race and stuffed it with a 426 inch Chrysler Hemi. The team suffered a severe fire that made many magazines. The pair retired from funny car racing after the1970 season. Rollie Lindblad continues to build race cars to this day. (Handout photo courtesy of Big Bob Snyder; information from Dennis Doubleday and Draglist files). Harlan Thompson later went on to fame as a hired driver in the seventies and became Europe�s most successful driver in the eighties. 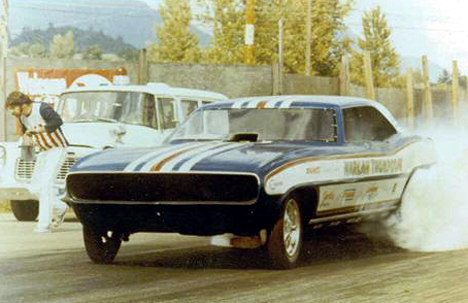 But Harlan began his funny car career in the seventies with this 69 Camaro. The Poulsbo, Washington, based racer bought the ex-Art Whipple machine from Jerry Ruth in 1971. Harlan did not race the car very long, running it off the end of a Northwest track. Thompson became a hired shoe, driving the Time Machine, Tom n' Jerry, Fireball Vega and Monza, Saturday Night Fever, and cars for Gary Richards and Knut Soderqvist. (Photo and Information from Draglist files). We love obscure funny cars here at 70s Funny cars and here is a great example of one from Texas. Bernie Williams had been one of the drivers of the Hunt & Taylor Hemi Hoss Mustang funny car in the 1970 season. Williams returned to racing with this Corvette called the Tasmanian Devil. The Corvette was undoubtedly the former Phantom funny car of Wayne Wilder, a very lightweight machine originally built by T-Bar chassis in Dallas. Little else is known about the performance of the winged Corvette, except that it ran both alcohol and nitro at various times. (Photo courtesy of Hector Leal and www.roddingandracing.com; information courtesy of Dennis Doubleday and Draglist files). Bill Moore, like many other alcohol racers of the mid-seventies, raced against his nitro big brothers. Racers did this for several reasons: having a place to race, guaranteed money, no local circuit for alcohol cars, and to get away from having to race the lighter, swoopier dragsters in Pro Comp. Bill ran his funny in the Texas Pro Fuel Circuit to fill out fields and to make some money. Moore could run mid-sevens with this little Cuda. He built a new Monza in 1976 and continued to race with the AA/FCs. 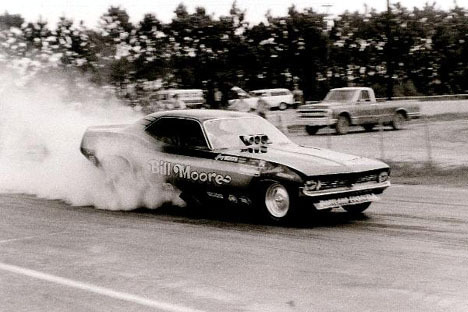 Moore retired from racing before the advent of the All American Funny car Circuit for alcohol cars in 1978. (Photo courtesy of Hector Leal and www.roddingandracing.com; information courtesy of Draglist files). Dennis Piranio did not run nitro in his Performance Engines Vega funny car, but he did run the car against his fuel powered cousins. The Performance Engines machine was built to replace his AHRA record holding AA/GS Anglia and was originally slated to run an Anglia body on the Texas Anglia Circuit. Piranio built the chassis and engine and had an Anglia body ready to mount, but changed his mind and mounted the Vega body to go funny car racing. 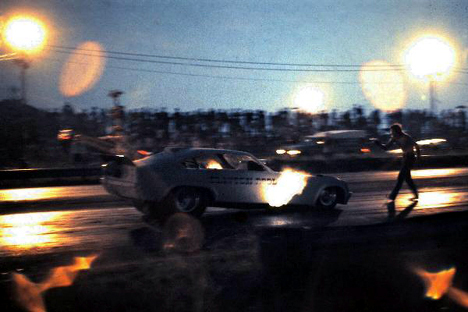 Dennis raced the car against AA/Funny Cars in NHRA Division 4 and match race action, running low sevens with consistency. He replaced the short Vega in 1977 with a new, longer Mustang II, and continued to have great success in Division 4. Piranio continues to run Performance Engines. (Photo courtesy of Hector Leal and www.roddingandracing.com; information courtesy of Dennis Piranio and Draglist files). Clayton Pool is a free spirited racer from the great state of Texas. Pool raced Anglias, injected fuel funny cars, rocket cars, and nitro funny cars. Pool built this funny car in the mid-seventies to race in Division 4. 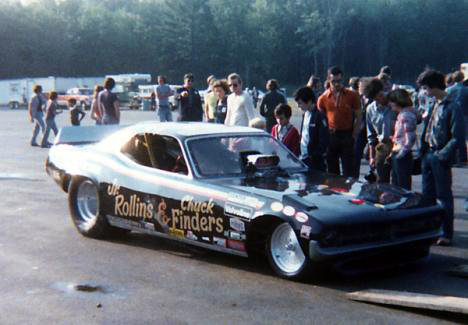 The Hemi-powered Vega ran a known best of 6.89 at 200 plus. Clayton retired from drag racing in the eighties but later returned with a Pro Mod and finally another alcohol funny car. (Photo courtesy of Hector Leal and www.roddingandracing.com; information courtesy of Clayton Pool and Draglist files). Rick Stambaugh got into funny car racing with the Norseman Firebird in the early seventies, and then took a few years off. Stambaugh returned with this Logghe Stamping built New Generation Charger in 1976 with Tom Stephens at the wheel. 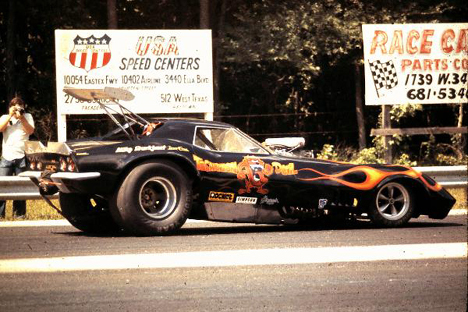 The team ran the Donovan powered car in the tough Northeastern funny car wars, hitting a 6.95 known best in 78 before retiring. Stambaugh came back with the old chassis adorned with a Corvette at the start of the nostalgia funny car craze and also ran as an AA/Fuel Altered. (Photo courtesy of Norman Blake, info from Rick Stambaugh and Draglist files). 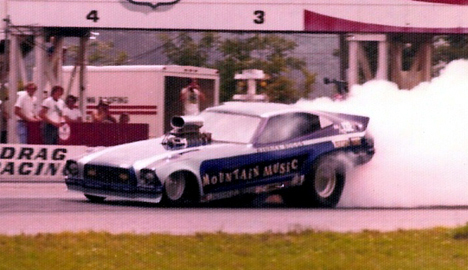 The Mountain Music machine is a one of the few funny cars to run out of West Virginia. The team of Roger Hamrick and Joe Boggs began their fuel career in Top Fuel, but built this Mustang II in 1975. The car featured a J. Ed Horton chassis powered by the big block Chevrolet out of the dragster. Hamrick drove at the beginning with Joe Boggs doing the tuning. Art Suiter later took over the driving chores. The car ran best times in the low sevens and high sixes. (Photo courtesy of David Oakes; information courtesy of Rodger Hamrick, Art Suiter, and Draglist files). Chuck Finders was a well known chassis builder and gasser racer who had moved to Ohio in the late sixties. By the mid-seventies, Chuck had switched over to racing fuel funny cars. Finders is best known for the High Speed Vega and High Speed Monza machines that he campaigned with Ken Thornburg. 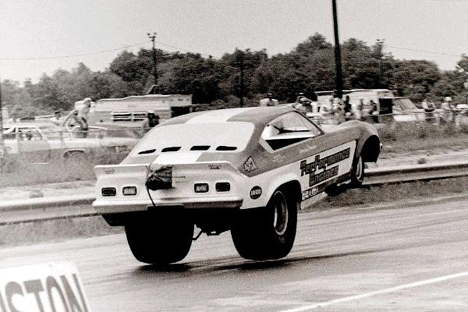 Finders partnered with Jr Rollins in 1976 to race this Cuda, which they had purchased from Bob Larimore (who had raced it as the Circus Cuda). Finders and Rollins raced the car for one year, and then Finders and Ken Thornburg built a new car for 1977. (Photograph courtesy of James Morgan; information from Draglist files).